Ever wanted to export historical price data so that you can perform your own analysis using custom tools that you are familiar with? Ever wanted to export the LIVE tick data so you can analyze what is happening in the market in real time? Do you want price data that actually reflects the spread on your account type? If so, then this strategy add-on is perfect for you. The Price Data Exporter runs as a normal strategy, but does not perform any trading. Each time the price updates, it exports the price data to a configured Comma Separated Values (CSV) file. This file can then be read in by your spreadsheet, or whatever tool you desire and your own custom analysis on the price data can be performed. 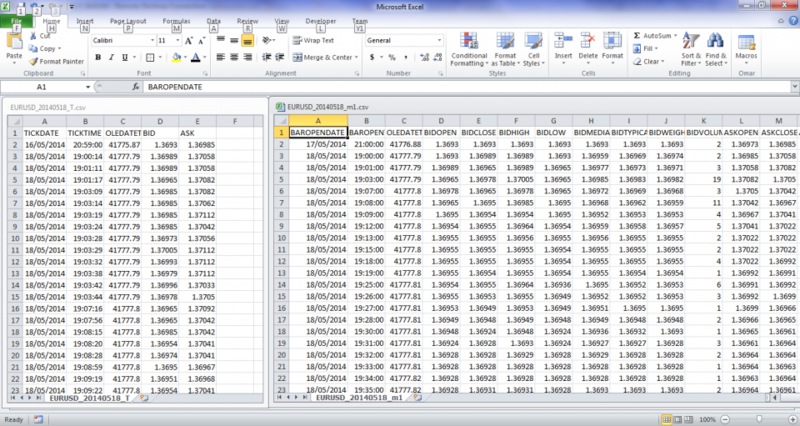 Additional calculated prices such as Median, Typical and Weighted. and if the current bar price is non-tradeable, the comments column will include a statement accordingly. To export historical data, simply run the tool in the Strategy Backtester that comes bundled with FXCM Trading Station. To export current LIVE data, simply run the tool as a strategy in the Strategy Dashboard and watch live data being exported on the fly! Additionally, the tool can convert Dates and Times into UTC to help deal with that annoying daylight savings. * NOTE: Tick data is only accurate in live mode. Historical backtesting does not provide accurate tick data, but rather a summary of the m1 bar. Time frame: The timeframe to export data. Can be bar or tick. Line Limit: If requested, the tool can be configured to terminate after a certain number of lines have been exported. Delimiter: You can choose what type of delimiter to use from the following options. Header: If requested, a file header can be created when opening a new file. UTC Times: If the server time zone is confusing, the times can be converted to UTC to allow consistency when dealing with daylight savings etc. Output Path: The path to the folder where to create the output file. File Name: The name of the output file. For convenience, two wildcards can be supported.